Life, in all of its frequent “nothingness,” is really something to behold. 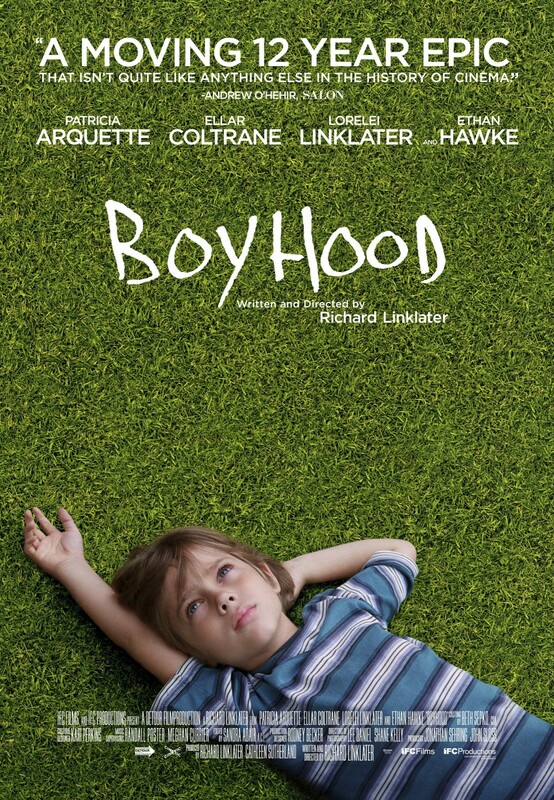 Boyhood isn’t so much a story, but a presentation of life, of both the smaller moments and the larger ones. Young Mason Jr. (Ellar Coltrane) is introduced to the audience as a six year old in early grade school. Along with his older sister Samantha (Lorelei Linklater) and single mother Olivia (Patricia Arquette), they live a pretty simple existence in Texas. Life is anything but simple though, as Mason’s eyes see quickly. Girls, identity, a father-son relationship, and other happenings give meaning and ongoing experience. The key is however, that all of these happenings shape our existence, and are all very, very important, not to mention astonishing. There are coming-of-age movies, and then there is Boyhood. As stated previously, it doesn’t really feel so much like a movie as it does an exhibition of 12 years of life, a literal coming of age on a screen. Being as it was filmed, as everyone I’m sure has heard 100 times, over a 12 year period, part of its allure is seeing the natural aging and actual changes of its stars. There is something awesome and crazy about seeing Ethan Hawke as he was in 2000-2001 and knowing that he either was filming, getting ready to, or just wrapped up work on Training Day. This is intriguing and original, but it never comes off as a gimmick to mask issues in the movie. Rather, it only enhances its positive qualities, to which there are many. A story exists here, just not of the “here-to-there” variety. Directed by Richard Linklater (School of Rock, Before Trilogy, A Scanner Darkly), it is very loose, free-flowing, and has no interest in being conventional in its storytelling. Even its timekeeping method is unconventional; aside from the once-in-a-while age and year announcement, Linklater prefers to leave the audience to decipher the year through visuals such as video games, music, and books. Events appear to happen organically, and this is reflected in the editing. There is no fade to black or rapid splice/cut that signals a new year, it just occurs. It is similar to an individual’s birthday in a sense. Eventually, these yearly markers just blend in to one another, the only representation of them occurring being the visible weathering. Clocking in at almost three hours, there is never a noticeable feeling of this overstaying its welcome. Perhaps the last part of the film could have ended slightly earlier, as yours truly believes it would have made for a more sound ending, but this is just a matter of preference. Paraphrasing the great Mark Hobin here, Boyhood may be titled as such, but it “really could just as easily been called Fatherhood, Motherhood, Girlhood, etc.” Still, the events comprising of this presentation are seen through the eyes of Mason, played by Ellar Coltrane. Much like how he literally matures physically on screen, so does his acting skill. Really, it hardly even feels like acting, and for this film, that isn’t a bad thing. Coltrane just carries himself like a normal and average kid, realistic and true to form. Honestly, this feels as if this movie is his actual life, and he is just going along with it. His career is going to be interesting to watch. From the moment Patricia Arquette appears on screen, it can be seen that the work she will turn in will be something special, and it truly is. And while it may not be true bravery, if such a thing as “Hollywood bravery” exists, Arquette deserves a 10 for submitting herself and seeing herself change, which can probably be a little jarring. But back to the work she does: it is touching, saddening, and introspective. Like any truly great performance, the work is of high quality throughout, but there is one scene in particular near the end that stands out and will likely be remembered for years and years. People often say that the father figure is the most important one in a son’s life. Every time Ethan Hawke appears on screen, it is important, and not because he is necessarily saying important things, which he does do. It is simply the fact that he is there, for his son, and for his daughter. He is the fatherly yin to the motherly yang. There is a real regret and realization of limitations that Hawke conveys effectively, but he doesn’t let that serve as an excuse for failing to be there for his youngsters. It resonates just as strong as Arquette’s performance. Yours truly’s favorite show of all time is probably The Office (US version). One great quote occurs near the end of the series, where Pam opines that “There’s a lot of beauty in ordinary things. Isn’t that kind of the point?” There will likely never be another Boyhood, something that cherishes and takes pride in something so ordinary such as growing up. It is a film that even challenges the conventions of what a film is in some cases. Regardless, whatever it is needs to be witnessed. Photo credits go to impawards.com, hitflix.com, aintitcool.com, and joblo.com. Great review dude! You’re right, there likely will never be another thing like ‘Boyhood.’ Ever. And I think that’s a good thing. Richard Linklater has really outdone himself here, and while it will be kind of predictable I still would like to see this exquisite production take home top prize at the Oscars in a few weeks here. Tremendous film and Linklater is the only one who could ever pull this off. This is the frontrunner I believe, and for great reason. Thanks for the thoughts Keith. Love your review..just wished I loved the film as much..
Didn’t enjoy it much Peggy? I really need to see your take now. Thanks for stopping on by! Appreciate it Mark. I loved that line you used, and it is true. Still need to see the official noms, but its performance at the GG’s make it seem a strong favorite for the Best Picture. Good review. Will have to catch it for sure now that it has started to rake in some awards. On uniqueness alone, it is a mandatory view. Really thank you for stopping by man. Good review Jackson. It’s the kind of movie that feels like nothing’s really happening while you’re watching it, until you realize that, simply put, it’s life that’s happening. It is sort of mind-blowing ain’t it? Really high-level stuff. Great review! So glad Linklater is finally getting attention, considering he’s constantly been overlooked over the years. He has made some of my favorites: most notably the Before trilogy and Dazed and Confused. Completely agreed about Patricia Arquette as well. She was amazing. Appreciate it! I really need to get on the Before trilogy, heard amazing things about it. From what I have seen of the Oscar stuff, this is at the top.